Urologist Gregory Zagaja, MD, right, is a member of the testicular cancer treatment team. 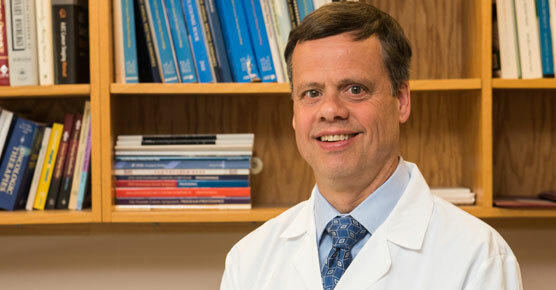 When patients with testicular cancer come to the University of Chicago Medicine, they can be certain to receive the most advanced tests and treatments available — including minimally invasive surgical approaches and stem cell transplantation — from some of the nation’s leading physician experts. Our goal is to help our patients beat cancer. Our physicians also place great emphasis on quality of life issues, including retaining sexual confidence after testicular cancer surgery. Many cases of testicular cancer are straight forward, and the treatment path is well defined. However, patients with risky or rare types of testicular cancer can benefit from a team approach to cancer care like we have at UChicago Medicine. To ensure we are considering all possible aspects of a patient’s individual case, our medical oncologists, surgeons, radiation oncologists, radiologists and pathologists convene to discuss and identify the best treatment options. We also work closely with pediatric cancer specialists colleagues at UChicago Medicine Comer Children's Hospital on the care of children and teenagers with testicular cancer. Not all testicular cancer is the same. Our highly experienced pathologists are experts at identifying both rare and common forms of the disease by examining cancer cells under a microscope, while also considering blood markers. Seminomas: A small proportion of these cancers may increase blood levels of a protein called human chorionic gonadotropin (HCG). Classical seminomas account for most of these tumors and primarily occur in men ages 25 to 45. Spermatocytic seminomas are rarer and tend to occur in older men. Non-seminomas: These cancers often occur in young men in their late teens to early 30s. Embyronal carcinomas may increase levels of two proteins in the blood: alpha-fetoprotein (AFP) and human chorionic gonadotropin (HCG). Yolk sac carcinomas typically occur in children and also raise AFP levels. Choriocarcinomas are rare and increase HCG levels. Teratomas are also rare and divided into three types: mature, immature and teratoma with somatic type malignancy. This rare type of testicular cancer starts in supportive tissue called stroma. The two types of stromal tumors — Leydig cell tumors and Sertoli cell tumors — tend to be less aggressive and don’t typically spread beyond the testicle. When other types of cancer (e.g., leukemia) spread to testicular cells, it is known as a secondary cancer. Nearly all men with testicular cancer have the cancerous testicle surgically removed. Our internationally respected surgeons perform this surgery through a small incision, and most men are able to go home the same day. When the cancer has or may have spread to the lymph nodes, our surgeons may recommend surgery to remove the lymph nodes in the abdomen so our pathologists can examine the nodes for cancer cells. This surgery is called retroperitoneal lymph node dissection, or RPLND. The intent of the operation is to cure the cancer without the need for additional treatment. 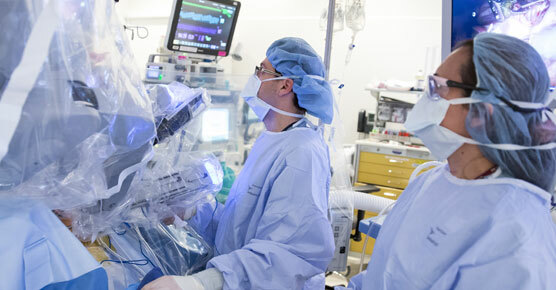 Our surgeons are among a select number in the nation using robotic-assisted techniques for certain men undergoing RPLND procedure, which allows them to operate through tiny incisions with a quicker recovery. Because men have two testicles, they can typically father a child with only one testicle. Some men may choose to have a prosthesis implanted, which can be done during the testicular surgery or at a later date. Radiation therapy can be very effective at treating any cancer cells that have migrated to the regional lymph nodes in the abdomen, particularly for patients with seminomatous testicular cancer. When testicular cancer has spread outside the testicles, chemotherapy is often recommended. It may also be recommended to reduce the risk of testicular cancer recurrence. When aggressive or recurring testicular cancer does not respond well to traditional therapies, patients now have another promising option: stem cell transplantation combined with high-dose chemotherapy. High-dose chemotherapy is effective at attacking remaining cancer cells. However, the patient’s stem cells, which are powerhouse cells that help repair the body, are also killed by these medicines. To address this issue, patients have their own stems cells collected and stored prior to receiving high-dose chemotherapy through UChicago Medicine’s robust stem cell transplant program. Then after chemotherapy, the patients receive a stem cell transplant (of their own stem cells). The combination approach is curing many men with previously incurable testicular cancer. UChicago Medicine is among a select number of medical centers in the region offering stem cell transplants for testicular cancer patients. Our physicians are involved in international clinical trials to evaluate how to further improve health outcomes and quality of life for patients undergoing these transplants. Request a second opinion with a UChicago Medicine urologic cancer expert. UChicago Medicine urologists provide a wide range of surgical and nonsurgical treatments for urologic conditions in men and women.